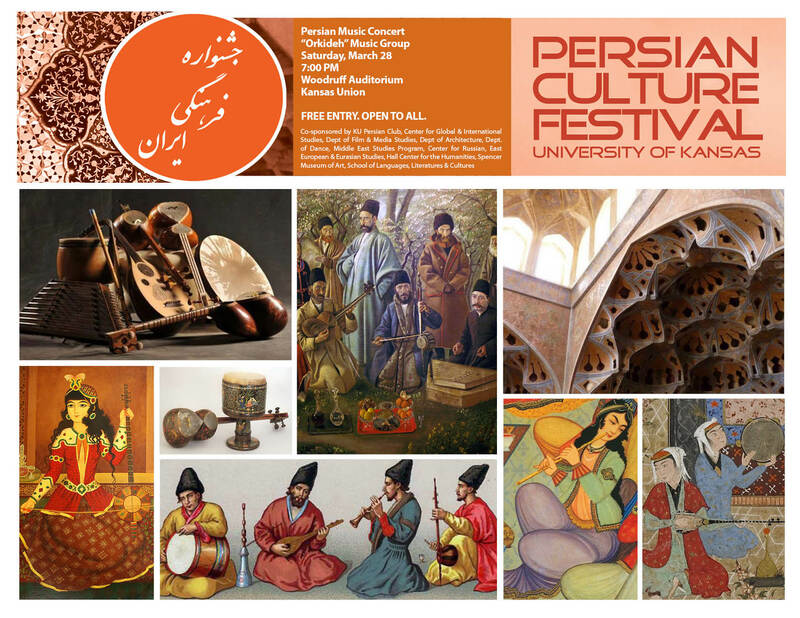 The first Persian Culture Festival at KU was held in spring of 2013. 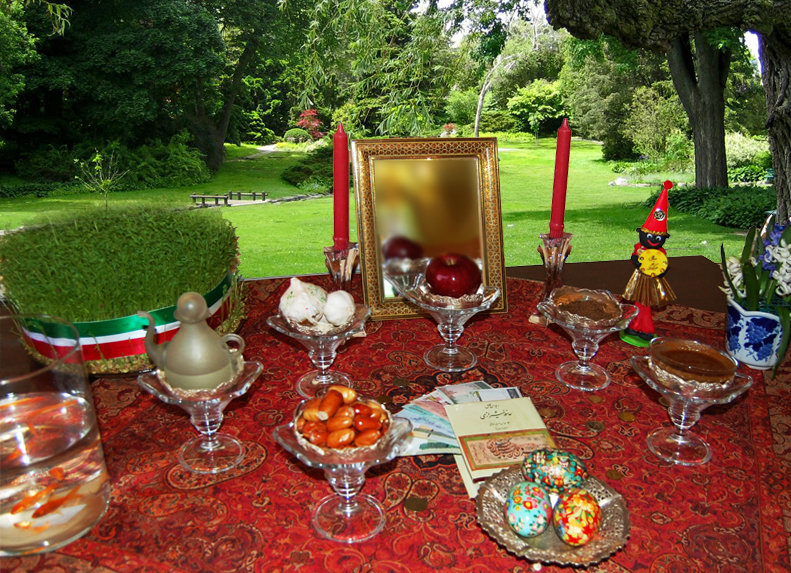 The festival always takes place around the time of Persian New Year (which falls on the spring equinox each year, approximately the 21st of March.) The festival, while in some ways tied to this important time of the year in the Persian calendar, is a celebration that reaches beyond Nowruz festivities and offers programming of a wide and varied nature each year. The Persian Culture Festival explores diverse aspects of Persian and Persianate culture, including the arts, language, history and other important contributions, through a series of activities and events aimed to both entertain and educate. All events are always completely free of charge and open to all guests from both the campus and Lawrence/KC Metro community interested in attending. 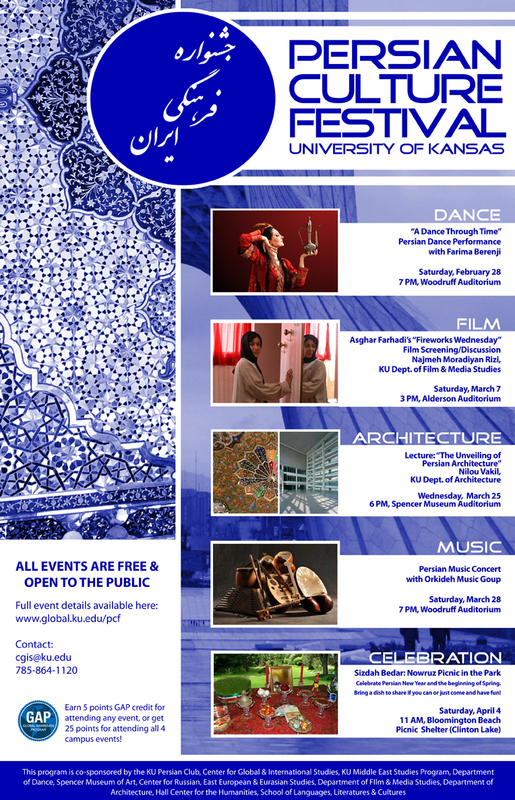 Full list of co-sponsors: KU Persian Club, Center for Global & International Studies, KU Middle East Studies Program, Department of Dance, Spencer Museum of Art, Department of Film & Media Studies, Department of Architecture, Center for Russian, East European & Eurasian Studies, School of Languages, Literatures & Cultures, Hall Center for the Humanities. With “Dance Through Time” Farima Berenji, internationally acclaimed dancer, will take the audience on a historical and artistic journey in movement. 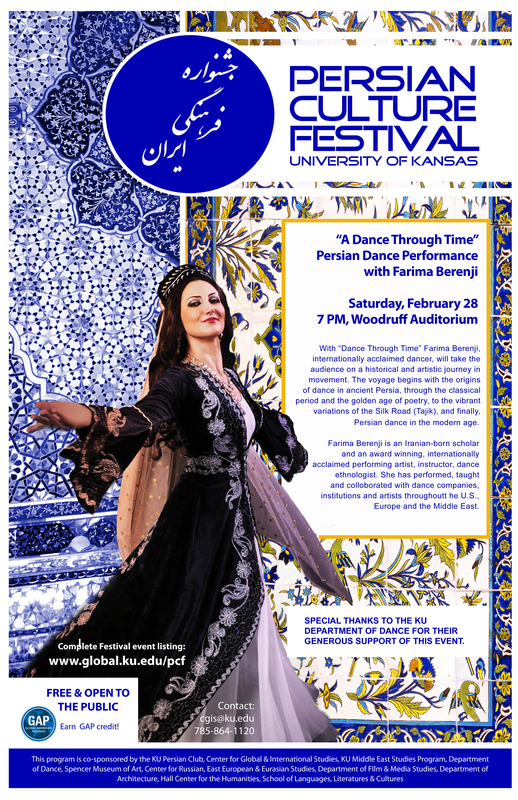 The voyage begins with the origins of dance in ancient Persia, through the classical period and the golden age of poetry, to the vibrant variations of the Silk Road (Tajik), and finally, Persian dance in the modern age. Farima Berenji is an Iranian-born scholar and an award winning, internationally acclaimed performing artist, instructor, dance ethnologist. She has performed and taught throughout Europe, the U.S. and the Middle East. Farima has lectured, facilitated research projects, collaborated, and choreographed for highly acclaimed internationally renowned companies such as Dance Versity, Ballet Afsaneh, Avaz Dance Company,Djanbazian Dance Company, Mystic Rose Dance Company, Rosanna Gamson World Wide, ODC, Tumata Organization of Turkey, UNESCO, the Egyptian Museum, the San Jose Museum of Art, the Iranian National Museum and Conservatory, World Dance Fusion of San Francisco, “30 Voices” Women’s Rights Organization, and many other companies, musicians, and artists based in U.S., Iran, Kurdistan, Azerbaijan, and Turkey. Fireworks Wednesday is the third feature from Iranian filmmaker Asghar Farhadi, director of Oscar-winning film A Separation (2012). Running time 102 minutes. The film is in Farsi with English subtitles. The film is set in Tehran, as preparations are being made to celebrate Iranian New Year (Nowruz), which begins on March 21, as well as the festival of fire, or “Chahar Shanbeh Souri”, that falls on the last Tuesday evening before the beginning of the New Year. The film’s scenes revolve around the images and actions traditionally performed at this time of year. Firecrackers and bonfires light the night sky in a profusion of noise and color. In accordance with the custom of "khooneh tekouni" (which literally means "shaking the house"), Iranian homes undergo a rigorous spring cleaning. On this auspicious evening, a young woman named Rouhi is employed by a young couple to clean their house. Sweet and naïve, Rouhi is engaged to be married, but her innocence is shattered when she finds her employers’ household in crisis over accusations of infidelity. Rouhi bears witness to a series of vicious disputes between this modern urban Iranian couple that then casts doubt on her own future prospects for marital happiness. Fireworks Wednesday delves into the untidy lives of contemporary Iranians, exploring the social hierarchies of the society to reveal the complicated relationships of its three-dimensional characters, beautifully realized by these seasoned actors. Read full review by Peter Bradshaw of The Guardian. 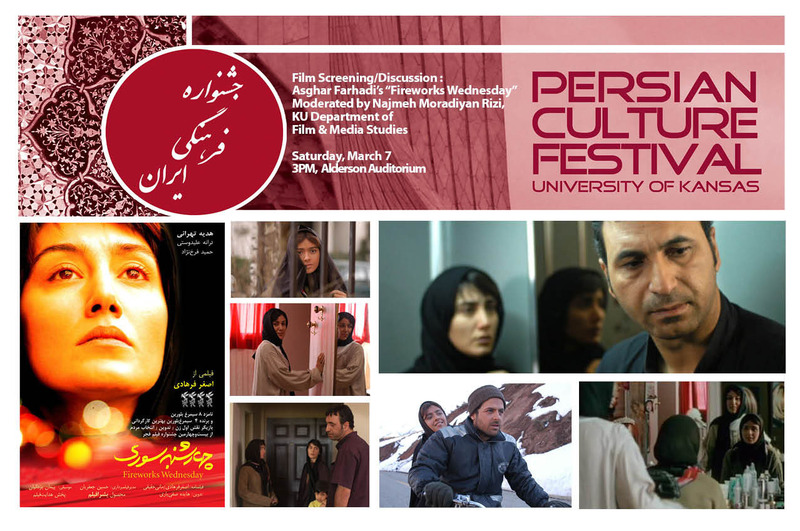 Najmeh Moradiyan Rizi is a Ph.D. student in the Department of Film and Media Studies at the University of Kansas. She received her B.F.A. (Cinema-Editing Concentration) and M.A. (Cinema Studies) from Tehran University of Art in Iran. After coming to the United States, she received an M.A. in Film Studies from State University of New York (SUNY) at Buffalo. Her current research focuses on the sexual and gender transformations of Iranian society and their representations in Iranian cinema. 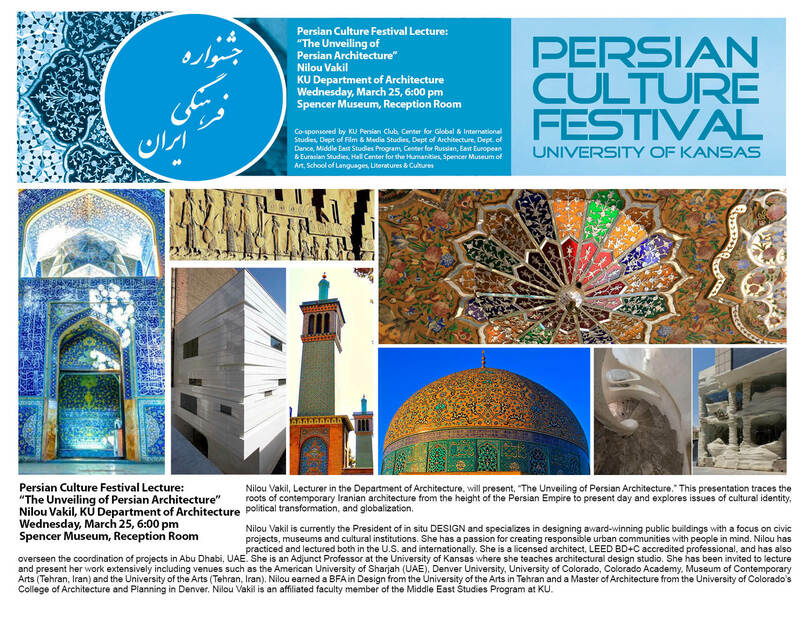 Nilou Vakil, Lecturer in the Department of Architecture, will present, "The Unveiling of Persian Architecture.” This presentation traces the roots of contemporary Iranian architecture from the height of the Persian Empire to present day and explores issues of cultural identity, political transformation, and globalization. Nilou Vakil is currently the President of in situ DESIGN and specializes in designing award-winning public buildings with a focus on civic projects, museums and cultural institutions. She has a passion for creating responsible urban communities with people in mind. Nilou has practiced and lectured both in the U.S. and internationally. She is a licensed architect, LEED BD+C accredited professional, and has also overseen the coordination of projects in Abu Dhabi, UAE. She is an Adjunct Professor at the University of Kansas where she teaches architectural design studio. She has been invited to lecture and present her work extensively including venues such as the American University of Sharjah (UAE), Denver University, University of Colorado, Colorado Academy, Museum of Contemporary Arts (Tehran, Iran) and the University of the Arts (Tehran, Iran). Nilou earned a BFA in Design from the University of the Arts in Tehran and a Master of Architecture from the University of Colorado’s College of Architecture and Planning in Denver. Nilou Vakil is an affiliated faculty member of the Middle East Studies Program at KU. The Persian Culture Festival is thrilled to welcome back Kansas City music group Orkideh! The group will present a highly entertaining program, performing a variety of Iranian music styles ranging from traditional to contemporary pieces. Bring a dish to share or just come and have fun in the park! What does Sizdah Bedar mean? Sizdah-bedar is an Iranian festival tradition, celebrated on the thirteenth (and last) day of the Nowruz (Persian New Year). Iranians have a tradition of spending the day outdoors on the 13th day of month of Farvardin. ''Sizdah-'' means thirteen, and ''-bedar'', means to get rid of, i.e "getting rid of thirteen". The first 12 days of the year symbolize order in the world and in the lives of people. The 13th day marks the beginning of the return to ordinary daily life. It is customary on this day for families to pack a picnic and go to a park or the countryside. It is believed that the joy and laughter of a celebration outdoors with family and friends can clean the mind from all negative thoughts, thus a good start to a new year.